Apologies for the lack of posts – I do have stuff to write, but have lacked the time and energy to write it! But I will soon, promise. This is a photograph of Mustrum who, like all the others, is enjoying this time of year when the sun falls into our bedroom (which is large, and has two tall windows facing south.). They move sleepily across the floor – the cats, not the windows! 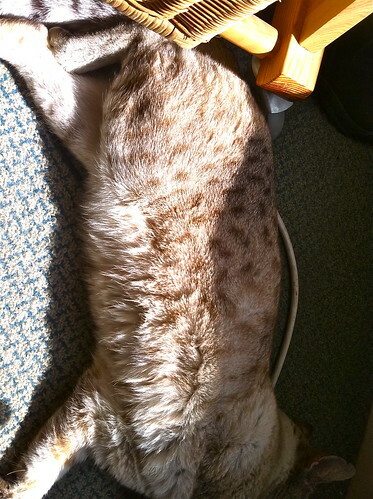 – following the sunshine, and Mussie is under the chair. Someone commented on Flickr that, in the thumbnail, he looked like “some kind of poultry or game, plucked and ready to cook”, and as I always say, there’s good eating on a Mustrum.